The interstellar travel is still nowadays a pure theoretical game. Sending human to the nearest stars is beyond our technological reach. There are only very little solutions, even theoretical, that could do it. Here, then, it is only a matter of theory and calculations in ideal cases. The bussard ramjet coined in its principle by Dr. Bussard  drag the scarce interstellar material to satisfy the propulsion energy needs. As no propulsion fuel is carried by the mobile, Tsiolkovsky constraint  does not apply. The constraint makes all known fuels including hydrogen nuclear fusion unable to reach required speed. The only fuels that are efficient enough are those who are almost fully converted into useful impulse. Some speculative theoretical solution have been proposed, including antimatter  or micro black holes . Most studies on this device have shown that it is not the easiest way to the nearby stars and a working implementation, if it ever happen, will probably be after fuel caring vessels . Indeed, the fascinating point is, for now, that it is not subject the Tsiolkovsky constraint. For this reason, it should later be used it to reach farther targets, as bussard ramjet does not seems to have terminal velocity other than speed of light . In the following we will study the ideal case where all captured material and energy are converted optimally without any losses into impulse for the propulsion. This assumption leads to a case simple enough to allow a full and exact algebraic resolution of motion equations. An other interesting point about this case is that it is the most efficient Bussard Ramjet device. I cannot guarantee the exactness of the following as this document have never be reviewed and so there should be several errors lying in. For this reason it would be very unwise of you to take it for correct. So I am very interested in any feedback you may send through email you will easily find on the site. This very theoretical device converts the whole energy collected, mass and kinetic energy, into light emitted exactly in the axis of mobile. We will work in the comoving frame, instantaneously at rest relative to the device, as explained in "Short course in special relativity" . We are going to use the conservation of energy and impulse summarized in special relativity formalism by 4-momentum. We scope 4-momentum at the begining of an infinitesimal interval of proper time τ and at τ+dτ, corresponding to interval t to t +dτ in medium frame. is speed of the rocket relative to the speed of light, v/c, in medium frame. is the boost corresponding to the speed x. It is arctanh(x), inverse hyperbolic tangent. Unlike speed, boost is additive, and thus integrable. is the mass of the collected material. is a time stamp in the medium (or collected material) frame. is a time stamp in the rocket frame. γ(x) is the Lorentz factor suitable for two frames moving with speed x from each other. Its value is (1- x2)-1/2. is the Lorentz factor corresponding to the speed β.
is the Lorentz transform matrix for the speed x, C.f (1.1). Reduced and relative cross section for material collection, equal to ρSc / M.
Between these to instants the rocket dredge an area S in a medium of density ρ. As it move forward of infinitesimal distance dx, it sweep a volume S dx during proper time dτ. We start working with spacetime event 4-vector proper time interval (c(τ +dτ), 0, 0, 0) and (cτ, 0, 0, 0) which can be simplified to ((c(τ +dτ), 0) -(cτ, 0,)), as only the dimension of space along motion is to be taken into account. We will use this simplification in the following. All collected mater m, including its kinetic energy, is converted into mass-less particles send toward x axis. Momentum of mass-less resulting beam is (q, -q) (1). As we will see later, it useless to explicit q, although it is straightforward. (1) A property of mass-less particles is the null self inner product of their momentum. As the momentum is a Lorentz transform invariant, and is m2c2. The graph below is Bβ / (1 + β), at sampled values ​​of B 1, 0.1 and 10 (2). Only part where β ≥ 0 is to be considered. (2) The physical value of B is indeed very small as the particles in the medium are scarce, less than 0.1 proton/cm3 and as the rocket weight is a matter of thousand of tons. Looking for an expression of β(τ), we want to integrate the previous differential equation. At first we try to figure the initial condition. When β > 0, acceleration is positive, and hence β(τ) is increasing function of proper time τ as soon as β > 0. Moreover if β = 0, acceleration will also be null. It is then required an infinite amount of time for the device to get an non null speed. The initial condition based on β = 0, will be reach as time tend to -∞. For τ = 0, . Converting boost back to β, we find . It follows that all the speed curves for any value of B cross at 1/3 of light speed. This crossing happen at τ = 0. (3) Thanks to Mathématica for the first form and to NumberEmpire for the second. A traveler to Andromeda Galaxy will see Milky way spinning. Clearly fixed frame do not make any sense as for special relativity. It is rather the frame of the collected matter, the medium frame, if indeed this material was having an homogenous motion. The "fixed" medium frame, can also be approximate with sun's proper frame neglecting the collected matter speed relative to it. The value of x of (1.11) and t from (1.13) are then stated to be time and distance observed from Earth. In the case of ideal bussard ramjet it is possible to derive an algebraic exact expression of elapsed time as a function of traveled distance. The following graph show the travel duration as a function of time that is t(x). Of course only the right part where x ≥ 0 is to be considered. 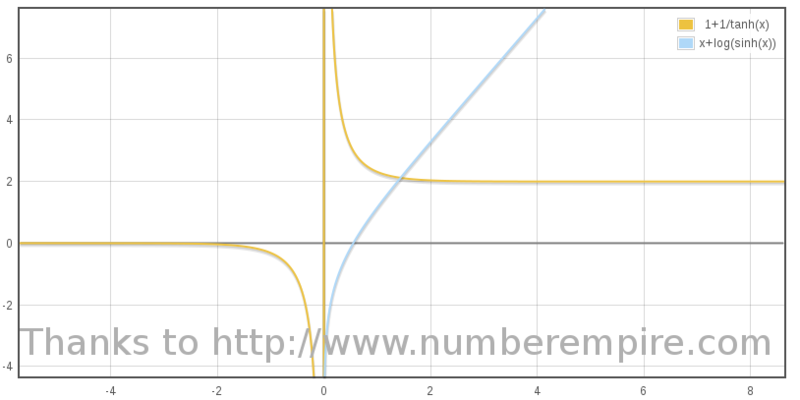 The curve asymptote when x tend towards +∞ for every values of B is x/c, which is the light speed corresponding line. This can also be deducted from (1.14) as if x/c is subtracted, the remaining terms tend to 1.348/B. The shift between curves summarize the ahead granted to a rocket with an other B after an infinite duration race started long in the past with both challengers swimming in a perfectly steady homogenous medium. The motion of the ideal Bussard Ramjet is now algebraically solved in its proper frame as well as in the medium collected matter frame which can also be approximate as Earth rest frame. The ideal Bussard Ramjet motion at low speed is according to (1.11), at best, exponential. Thus clearly this kind of device need an initial speed relative to the harvested medium. It is unlikely that this only propelling method is enough to cover all the travel. However, at relativistic speed range its acceleration tend to B/2 when time goes to infinity, with respect to (1.8). To my opinion, it is the only theoretical device that exhibit a such capability. This ideal rocket should head the race, of theoretical, faster displacement speed. Unfortunately any Bussard Ramjet practical achievement will experiment to any kind of loss leading to lesser capability. Investigation of outer space rocket appliances, Konstantin Tsiolkovsky, 1903. Local mirror, See also Wiki, if one do not read russian. Mathematical image were produced with mimetex. Most of free web hosting do not provided arbitrary binary cgi-bin, formulas have been processed with this especially crafted script. Reading the works quoted as reference has been a great help for this little work, particularly the Short course in special relativity of M. Strovink, as the article from Claude Semay and Bernard Silvestre-Brac . I have also make a intensive use online calculation resources as WolframAlpha and Number Empire, especially for integration and graphics. Graphing Puppies - How do you get a middle schooler stoked about graphs? One word: puppies! Home Design-Inspired Activities for Kids - What better way to learn about geometry and other core concepts than designing a room or even a whole home? 10 Enjoyable Math Crafts And Activities For World Maths Day - If your student thinks they’re destined to hate math because they prefer to use the creative side of their brain, give a few of these activities a try. 70 Cool Math Games - If you disguise math as a game (or 70! ), kids won’t mind learning arithmetic. Cooking with Recipes - Kids won’t be able to resist learning about fractions, multiplication and division if their favorite recipe plays a part. This lesson also has customizable, printable worksheets.